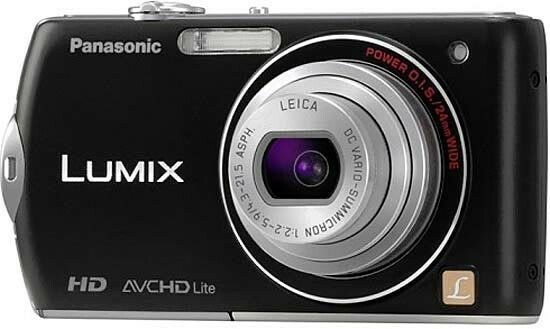 The Panasonic Lumix DMC-FX70 (also known as the Panasonic DMC-FX75) is a new touch-screen digital compact camera. Offering a large 3.0-inch LCD with full touch-screen operation, the 14.1 megapixel FX70 also features a bright f/2.2, 24-120mm 5x zoom lens, HD video at 1280 x 720 pixels in the AVCHD Lite format, Intelligent Resolution technology and improved Intelligent Auto mode with a new Motion Deblur anti-blurring function. The FX70 / FX75 is available in black in Europe and silver and black in the USA, priced at £269 / $299 respectively. Successor to the DMC-FX60, the new FX70 combines the point-and-shoot simplicity of that model with the touchscreen interface of the DMC-FX550, but almost entirely dispenses with any external controls, relying instead on interaction via the large 3 inch screen. Outwardly, the solid feeling, pocket-sized Lumix DMC-FX70 has a slim 22.8mm depth and glossy black and silver finish to our review sample. Weighing 1464g without battery or card inserted yet still feeling sturdy when gripped in the palm, feature-wise it includes an ultra wide, Leica branded 24mm lens. Beneath the unassuming but not unattractive metal and plastic exterior the FX70 packs the advantage of a 5x optical zoom, starting at the aforementioned wide angle 24mm equivalent (in 35mm terms) and peaking at 120mm at the telephoto end. The very bright f2.2 lens is stored compactly within the body when the camera is not in use, and its positioning and eventual prominence ensures, when active, that there's no danger of fingers straying into shot when shooting handheld. Its broad-ish (for a compact) focal range ensures this snapper has most everyday subjects covered, from landscape and group portraits to candid close ups. And, if you don't mind a resolution drop to three megapixels then use can be made of the device's Extra Optical Zoom function which utilises the central part of the CCD sensor - effectively a crop - to boost the reach to a 10.5x zoom equivalent. Also new to the FX styling is the rounded left-hand side, something of a departure from the previous boxy design. It doesn't really add anything in terms of overall functionality other than making the strap eyelet sit flush with the edge of the camera body, so its appeal is purely aesthetic. There's little if anything provided on the camera's rounded edges or smooth and shiny front and back surfaces for the user to get a firm grip on when taking photographs without the aid of a tripod - save for a small square of nine raised nodules at the back that fall under the thumb - it's important that the FX70's image stabilization proves effective to avoid external wobble translating into blurred images. Thankfully the FX70 has an effective anti-shake system, on this model the Power O.I.S. variant. Turn it on via the Stabilizer option in the main menu and the Panasonic Lumix DMC-FX70 automatically compensates for camera shake, which is a slight blurring of the image that typically occurs at slow shutter speeds when the camera is hand held. There are three different modes, Mode 1 is on all the time including image composition, Mode 2 is only on when you press the shutter button, and there's also an Auto mode. In practice I found that it does make a noticeable difference, as shown in the examples on the Image Quality page. You don't notice that the camera is actually doing anything different when anti-shake is turned on, just that you can use slower shutter speeds than normal and still take sharp photos. Thankfully leaving the anti-shake system on didn't negatively affect the battery-life, with the camera managing just over 350 shots using the supplied rechargeable Li-ion battery. The High Sensitivity mode also helps combat the effects of camera shake. When this scene mode is selected, the camera automatically raises the ISO speed from 1600 up to a maximum of 6400 and therefore allows for a faster shutter speed. This mode allows you to handhold the DMC-FX70 without using the flash and get more natural results, whilst at the same time freezing subject movement more successfully. There are some obvious drawbacks with this special scene mode, principally a significant reduction in resolution to a maximum of 3 megapixels in the 4:3 aspect ratio, and the Quality is also set the the lowest level. The user guide states that "you can take pictures suitable for 4x6 inch printing" using the High Sensitivity mode. You also need to select the right scene mode and therefore have some idea about when it is applicable to your subject. The Intelligent ISO menu option is the third way in which the DMC-FX70 attempts to avoid subject blur in low-light conditions. The camera automatically sets the appropriate shutter speed AND ISO speed for the subject that you are taking pictures of. So if you're taking shots of a child indoors, the DMC-FX70 automatically raises the ISO and in turn the shutter speed to avoid blurring the child's movement. If the subject is still, then the camera chooses a lower sensitivity and slower shutter speed. It's a clever idea that works well in practice, with the camera generally choosing an appropriate combination of shutter and ISO speed. You can also limit the maximum ISO speed that the camera can choose, which I'd strongly advise, as the fastest available setting of ISO 1600 produces very noisy images - ISO 800 is a better choice. From the front the DMC-FX70 displays a clean, unfussy faceplate, with the retractable lens barrel the most prominent feature, top left of which is a lozenge shaped window for the built-in flash - sufficiently clear of the camera edges to avoid fingers partly obscuring it - and to the right, we also find a small porthole housing the reasonably powerful AF assist lamp/self timer indicator. Moving to the top, set into a nail file-thin brushed metal panel that runs the length of the FX60's top plate is the shutter release button, the largest control here, encircled by a zoom slider with raised lip to the front in order to allow some purchase for the forefinger. Next to this is a partly recessed on/off switch. Power the camera up and in just over a second, we were ready to begin shooting, the rear 3-inch, standard-issue 230k dot resolution LCD having burst into life in the absence of any optical viewfinder alternative. Operate the zoom and the user can move through the complete focal range from wide to tele setting in just over two seconds, which again is fast without being surprisingly so. Also set into the FX70's top strip are two small slots housing the mono built-in microphone plus two rows of four further dots for the integral speaker - so barely noticeable that there's nothing to confuse first-time users here. A new addition to the FX70 is the useful Motion Picture button which sits alongside the shutter button, a logical position that can be operated with your forefinger. As you'd expect, it allows you to start recording a movie with a single push of a button, and then stop recording by pressing the same button, regardless of which shooting mode is currently selected. This is much quicker and more intuitive than having to select the movie mode then press the shutter button, as on most cameras. The FX70 can record HD 1280 x 720 movies at 30 frames per second in the AVCHD (MPEG-4/H.264) format. In addition it can also record Motion JPEG movies at 320 x 240 at 30fps, 640 x 480 at 30fps, 848 x 480 at 30fps and 1280 x 720 at 30fps, useful as this format can currently be shared more easily. AVCHD features almost double the recording time in HD quality compared with Motion JPEG, but software support is currently a bit thin on the ground. Panasonic describe it as the best mode for playing back on a HD TV direct from the camera, and Motion JPEG best for email and playing on a computer. The Panasonic FX70's Intelligent Auto mode also works in movies as well as for still photos. Simply select iA on the mode dial and press the Motion Picture button. The Intelligent Scene Selector automatically determines the most suitable Scene mode from Normal, Portrait, Macro, Scenery, and Low Light, Face Detection automatically detects a face in the frame and adjusts the focus, exposure, contrast, and skin complexion, Intelligent Exposure continually checks the ambient light level and adjusts the exposure setting as conditions change to prevent blown highlights and blocked shadows, and the POWER O.I.S. (Optical Image Stabilizer) and Motion Deblur mode help prevent blurring from hand-shake when using the zoom lens. Stereo sound is recorded during video capture via the large internal mic on top of the camera, which is a big improvement on the rather muffled noises recorded by most digital cameras, helped by the wind cut function which blocks out most of the noise from background wind. The HDMI port allows you to connect the FX70 to a high-def TV set, but only if you purchase the optional HDMI mini-cable. You can simultaneously take still images while recording movies, although only at a reduced resolution of 3.5-megapixels, while the Video Divide function divides the video into two sections to shorten or delete them in-camera. You can use the zoom lens during recording and really make the most of the 5x focal range, although the zoom speed is unfortunately much slower than for still images and you can hear the zoom mechanism during recording. Focusing is set via the Focus mode dial on the top of the camera. On the negative side, you'll find that if you choose continuous auto-focus, areas of the video will be blurred before becoming sharp again as the camera tries to refocus. On a more positive note, the the FX70 is quite fast at re-focusing, and having this system is much better than not being able to auto-focus at all. The back of the Panasonic Lumix DMC-FX70 is unsurprisingly dominated by the LCD, stretching across almost three quarters of the available space. The DMC-FX70's main innovation is its touchscreen interface. Panasonic have departed from their previous touch-screen cameras, where they wisely restricted the amount of things that you could do by interacting with the screen, now having to push and prod the LCD for almost all the camera's options. A column of five icons on the right of the screen - Exposure Compensation, Flash, Auto Focus, Self-Timer and Display- effectively replaces the FX60's four-way controller and Display buttons, while alogn the bottom are icons for accessing the Quick Menu options, setting the burst shooting mode, and enabling the ability to take a picture simply by touching the screen. The most immediately noticeable function is the ability to use the 1-area AF mode to focus on your main subject simply by touching it on the LCD. If the subject then moves, the DMC-FX70 cleverly follows it around the screen using the the AF tracking function. If the subject exits the frame entirely, simply recompose and tap it again to start focusing. Impressive stuff that makes focusing on off-center subjects fast and intuitive. It is a little too easy to accidentally press the screen and set the focus point to the wrong area for the current subject, but a simple tap in the middle of the LCD will center the AF point (or you can turn this feature off altogether). When Intelligent Auto is switched on, the DMC-FX70 changes the scene mode used when you touch the subject, for example selecting portrait mode if you touch a face and macro mode if you touch a close-up flower. If you prefer to manually focus rather than use the snappy AF, you can magnify any part of the subject by 1x, 5x or 10x by simply dragging the image around the screen. The final touchscreen ability from an image composition point of view is the ability to release the shutter, with a small icon on the right hand screen enabling this functionality, and then a single on-screen tap all that's required to take the picture. Most of the menu options can be changed via the touchscreen interface, notably the Quick Menu and the Info Display menu - the main exception to this rule is the Main Menu, which is still controlled via the navigation buttons. You can also control image playback by touching the screen, with the ability to tap a thumbnail to see the full-size version, scroll through your images by dragging them from side to side, and magnifying them up to 16x. As mentioned, the control layout at the back does away with virtually all physical controls at the rear in deference to its touch screen, with just three positioned to the right. There's a slider switch for alternating between image playback and capture modes. Unlike on most competing models that allow you to quickly jump out of review mode with a half press of the shutter release button should a photo opportunity arise, here you have to physically flick the slider and wait for the camera to adjust settings. Better perhaps then to have the capture mode as the camera's default setting and ideally have a separate dedicated playback button. Beneath this, instead of the regular mode wheel, we get a mode button. Press it in capture mode and four options appear on screen as lozenge shaped icons, each large enough to select with a finger press. The choices are the self explanatory Intelligent Auto, where the camera chooses the best settings for the user's chosen subject. Panasonic have tried to make things as easy as possible for the complete beginner by providing this shooting mode, which allows you to point and shoot the camera without having to worry about choosing the right mode or settings. Intelligent Auto Mode automatically determines a number of key criteria when taking a picture, including selecting the most appropriate scene mode (from 5 commonly used presets) and ISO speed, and turning face detection (up to 15 faces, even sideways on), image stabilization and quick auto-focus on. The Intelligent Auto Mode includes Intelligent Exposure, which increases exposure only in the under-exposed areas of the image, Digital Red-eye, which automatically detects and removes red-eye, and AF Tracking, which continually tracks a moving subject and keeps it in focus, without you having to hold the shutter button halfway down as on most other cameras. Face Recognition is a fun and genuinely useful new feature which "remembers" up to 6 registered faces and then always prioritizes the focus and exposure for that person in future pictures. Very useful for group shots where you want your loved ones to be the centre of attention. You can specify the age of the registered subject, stamp the age of the subject onto your photos, change the focus icon for a particular person, and playback only the photos that contain a certain face. The camera will even automatically switch to Baby mode if someone registered as less than 3 years old appears in the frame! New to the FX70's Intelligent Auto functionality is the Motion Deblur mode, an automatic combination of Intelligent ISO Control and Intelligent Exposure. The former automatically adjusts ISO setting and shutter speed according to the subject’s movement while the latter optimizes the exposure. The camera then sets the appropriate shutter speed to keep the subject sharp, raising the ISO speed if necessary. Three different Colour Effects are available in iA mode, including the rather curious Happy mode, which optimizes color, saturation and brightness to make both photos and movies more vivid. Note that the camera's Intelligent Resolution technology is always activated in the iA mode. This makes a standard image look like a higher resolution one by processing the contour areas, texture areas and smooth areas individually, and it also digitally boosts the zoom magnification from 5x to 6.5x. In practice the Intelligent Auto Mode system works very well, with the camera seamlessly choosing the most appropriate combination of settings for the current situation. The 6 available scene modes are Macro, Portrait, Scenery, Night Portrait, Night Scenery and Sunset, so obviously not all situations are covered by Intelligent Auto Mode, but it does work for the majority of the time. It makes it possible for the less experienced photographer to easily take well-exposed, sharp pictures of people, scenery and close-ups by simply pointing and shooting the camera. Intelligent Resolution is a brand new feature for Panasonic's 2010 range of compacts. It performs two main functions - it either makes a standard image look like a higher resolution one by processing the contour areas, texture areas and smooth areas individually, or it digitally boosts the zoom magnification from 5x to 6.5x with minimal loss of quality and no reduction in resolution. In both cases, it's easy tell which image was taken with Intelligent Resolution turned on and which ones with it turned off, particularly if viewing onscreen at 100% magnification, as our test shots on the Image Quality page show. The difference isn't quite so apparent on a print up to A3 in size, but I'm not convinced enough to recommend it except when you really need the extra reach - it undoubtedly improves on the digital zoom, but not so much that I'd regularly use it. Intelligent Auto is followed by the Scene Mode option, which lets the user select from amongst a broad range (27 in total). Not only do we get a portrait mode, we also get a soft skin portrait mode and the ability to physically stretch or re-shape a person's physique (to high or low degrees), plus, ape-ing the latest Olympus DSLRs, a pinhole camera and film grain modes. High-speed burst and flash burst mode can also be selected. A pretty comprehensive range then, bettered only by Casio's BestShot equipped cameras. Normal Picture provides the greatest level of control over what is predominantly a point-and-shoot camera. Select this option and then press the camera's Menu button and you're provided access to a wider range of functionality than offered by the pared down previous modes, laid out across four successive screens; namely the ability to adjust not only picture size and quality but ISO sensitivity too. As expected, white balance plus metering modes - multi zone, centre weighted or spot can be manually selected in Normal Picture mode, while the user can likewise also implement intelligent exposure and face recognition mode, as found on other new Lumix models. Among the other tweaks that can be made in Normal Picture mode is the ability to alter contrast, sharpness, saturation and the degree of noise reduction via a plus or minus slider, while image stabilization can be turned on or off. The final shooing mode is the new Cosmetic Mode, which allows you to take creative portrait photos by choosing the skin colour and the intensity. There are three skin colors on offer (soft skin, natural skin, summer look) and three degrees of transparency of skin detail (low, standard, high). While the left hand flank of the camera - if viewing the FX70 from the rear - is devoid of any features, the right hand side features an indented eyelet for attaching the provided wrist strap, alongside which are two covered ports for attaching a HDMI cable and connecting the camera up to the TV and a combined AV out/USB socket. The latter cables for this at least comes provided in the box, although there's no HDMI cable supplied. At the base of the FX70 we find a metal screw thread for a tripod which is inconveniently located in the far-left corner, alongside which is a sliding compartment that houses both the rechargeable battery and a slot for an optional SD / SDHC card.